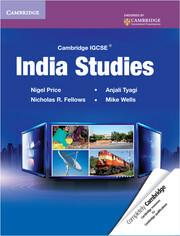 Written for the Cambridge International Examinations syllabus, Cambridge IGCSE India Studies adopts an enquiry based approach with a strong focus on investigating and analysing the emergence of contemporary India. In the process, it promotes the development of core skills and ways of thinking critically that are essential to succeed in secondary and higher education and all professional areas. This will encourage students to be creative, innovative, enterprising and independent. 2: How is the policy of economic liberalization in India best explained? 4. How far has economic liberalization changed India? 5. To what extent have economic reforms been too modest and its human benefits too uneven? Unit III. The Social and Cultural Development of India since 1984: Unit IV. Geopolitics: Redefining India's Regional and Global Role.